Do all Project Managers rely on MS Excel? [The answer appears to be they do]. Horizon PPM Blog > PM Articles > Do all Project Managers rely on MS Excel? [The answer appears to be they do]. MS Excel is great, but isn’t there a better alternative for managing our projects? Earlier in the year, I canvassed a number of very experienced project management professionals. These ladies and gentlemen work across sectors including private industry and not-for-profit and some government organizations. The organizations vary from having a handful of project managers to hundreds. Some of the organizations and the projects they run are of a local nature and are relatively small in size. However the majority of them reflect the global world we live in and have experience delivering projects in multiple geographic locations with distributed teams and often running into the multi-millions in investment spend. Now there are literally hundreds of project and portfolio management tools on the market. These range from the enterprise tools typically costing over £1 million each year to run such as CA Clarity, Oracle Primavera and Microsoft Project Server to the every day utility apps costing just a few pounds that can be loaded onto a mobile or tablet and everything in between. My survey participants had experience of applications in both camps. This will come as no surprise but the response was a resounding 96.5% of project managers use MS Excel to run their projects. Even in cases where enterprise suites have been implemented the project managers are still using Excel to maintain RAID trackers, etc and then upload this into the central system at the end of the week. Excel is great at a lot of things and can be very useful for financial management and maybe configuration trackers at a push, but I was hoping that there would be a better option for day to day project management. 80% of these same project managers also reported that they spend anywhere between 4 hours and 2 days each week compiling, updating and publishing these status reports. [This is when they have a portfolio of projects to manage and it’s not taking them 2 days to just update things for a single project.] Nearly 60% of them also thought these reports were read many days later when the information was already stale or they thought they weren’t being read at all. 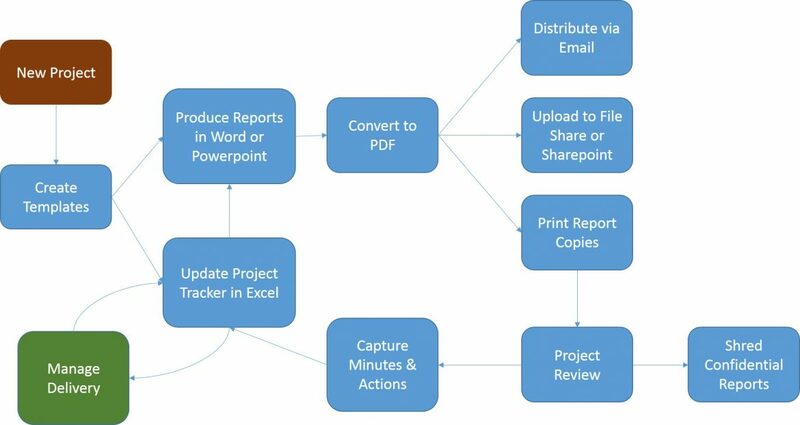 Does your reporting work flow look like the diagram above? Are you a PM spending all your time in “Excel Hell”? Does reporting in your organization support the need to communicate and collaborate or is it just the mandated process that has to be followed? I’m a Consultant Programme Manager with a technical habit so in my frustration I founded Horizon PPM to be part of the solution. HORIZON PPM is for project managers in a global, mobile and digital world. If this is of interest feel free to check it out at horizonppm.com.